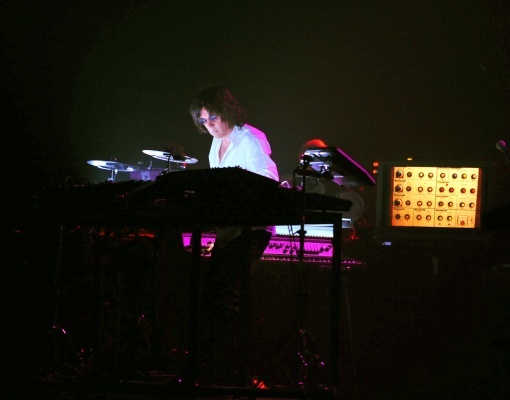 Jean Michel Jarre is one of France�s best known pioneers in Electronic Music. As the first western pop-musician he performed live in China and he holds the record of the having performed for the biggest crowd ever: 3,5 million people! After the release of AERO, one of the first (if not the first) release in fully engineered surround sound, he released the eagerly awaited album Teo & Tea. Since then Jarre, who is looking remarkably young and fit, is travelling backwards again. First with his "up close" theatre tour (amongst others in "Theater Carr�" in Amsterdam) featuring his first album Oxygene and now with his current "In- Doors" world-tour. Again the location was Amsterdam but this time the venue of choice was the Heineken Music Hall, renowned for its superb acoustics. 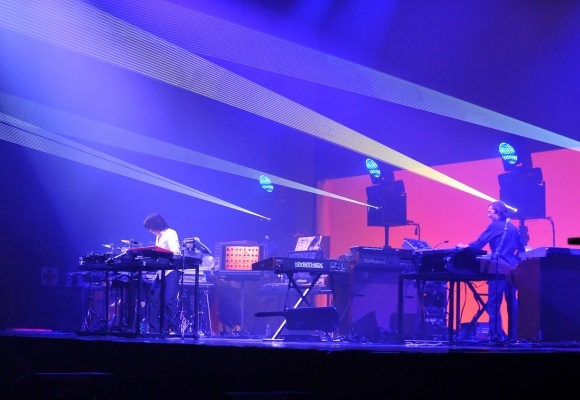 The big stage was filled up by four squares of keyboards and other electronics, one for each member of the "band". Centered at the front of the stage was Jarre�s set up, on his left side Francis Rimbert and on his right side Claude Samard and at the far end also on his right side: Dominic Perrier. All amplifiers were hidden so just the keyboards and the artists! The sound was again really awesome, maybe even a little too loud but extremely well balanced and crystal clear. An audience, immediately responding to the first notes of Industrial Revolution 2, welcomes Jarre who sticks his fist through a laser light curtain, glowing in the dark. Eventually Jarre moves towards his square and starts playing the "Nordlead" amongst others. With an occasional announcement it�s then a sort of "best of" from the first fifteen years of his career. The lights are getting more spectacular during the show and of course Jarre plays his laser-harp too. At the end of the show he apparently misses a switch and he has the wrong key, but he corrects it instantly. While the other musicians are concentrating on mastering all their electronics, Jarre acts like a rock-star, clapping his hands and inviting the audience to participate actively. 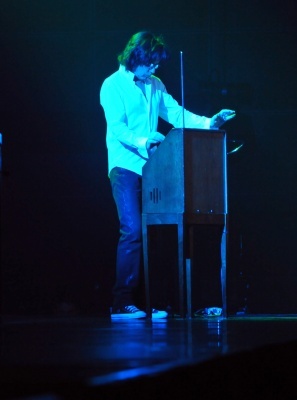 Jarre plays the synths, but also the keytar, the accordion and of course his oldest "lady" the Theremin. The impressive lightshow including the use of several lasers, proved to be beyond comparison and one of the best I�ve ever seen. Another striking feature of this concert must have been the fact that every sound heard on that night has been played live, which is rather unique for an "EM-concert". If you look at the setlist you can appreciate why you wish you�d been there too. The very best tracks from his most popular albums, in such a fine ambiance and played by excellent musicians, has been a genuine treat. Fortunately, Jarre played for about two hours, including the encores. If you take a close look at the guy, it�s hard to believe he actually is around 60 years old, because he only looks about 35 and that�s why I�m convinced he will be paying all of Europe another visit in the years to come: which is really cool! A final note about the photo�s: only a few photographers were allowed to shoot for more than the first 3 tracks. Unfortunately I wasn�t one of them. I was only allowed to take pics from both far ends of the stage while full lighting and the best bits of the masterly light show came much later in the show.